An international team of researchers, led by physicists from Lund University in Sweden, have confirmed the existence of what is considered a new element with atomic number 115. The experiment was conducted at the GSI research facility in Germany. The results confirm earlier measurements performed by research groups in Russia. By bombarding a thin film of americium (atomic number 95) with calcium ions, the research team was able to measure photons in connection with the new element’s alpha decay. Certain energies of the photons agreed with the expected energies for x-ray radiation, which is a ‘fingerprint’ of a given element. 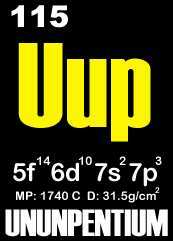 The new super-heavy element has yet to be named officially, but is known as ununpentium (from its atomic number, 115). A committee comprising members of the international unions of pure and applied physics and chemistry will review the new findings to decide whether to recommend further experiments before the discovery of the new element is acknowledged. The original press release may be found here. The results were published in the journal Physical Review Letters.